This post originally appeared in June 2012. Looking back now, it’s a huge relief that Auckland Transport did end up including the Eastern Link in the CRL project, as excluding it would have undermined the functionality of the CRL enormously. The Catchment – Aotea is about the same distance from Newmarket whether you go via Grafton or Britomart however there is forecast to be a bigger catchment around Britomart so it pays to serve the majority of people first. The Cost – My understanding is that due to the geography that grade separation is going to be tricky and therefore very expensive. The Cross – Future patterns discussed on this blog and hinted in a few planning documents suggest that we may eventually look to a cross type pattern when we eventually build a rail line to the North Shore, if that happened we wouldn’t need an eastern link so why spend money on it now. Of the CRL stations and Briomart approx 50% are forecast to go to Aotea with 30% going to Britomart and the remaining 20% going to both K Rd and Symonds St. With an Eastern link a direct journey to Grafton from the south opens up and I suspect that would help to balance these numbers out a bit as there might be just as many, if not more students that would benefit along with people visiting the hospital and local workers. The eastern link won’t come cheap, especially if it is grade separated however I think I may have come up with a way to reduce the cost but more on that soon. I really love the idea of the cross as it is really simple and also allows us to have a ton of capacity through the core of the network. Many people have commented that they are concerned that it is hard enough to build one CRL and that a second one would be almost impossible. Based on the current political climate that is definitely the case however I suspect that the CRL will be far more popular than it is envisioned and that will help in the case for future development. Regardless any other CRL style tunnel will not likely to even be started for another 15-20 years and so the question becomes, do we not build something now because we may do another project in 20 years time? My feeling is that 20 years is a long time for a project still pretty firmly in the maybe column at the moment. How we build the link may also have implications for when that other tunnel is needed but again more on that soon. 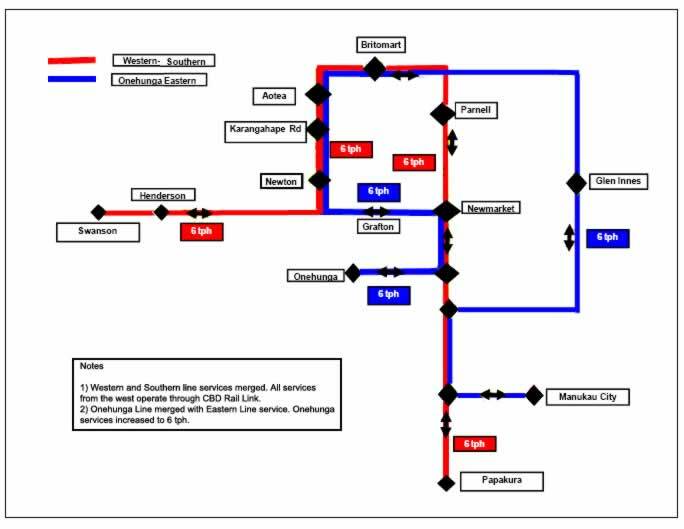 As mentioned earlier, assuming that the cost to grade separate the eastern link is too high, I think I may have a suggestion for reducing the price of the link however it does come at the cost of services. 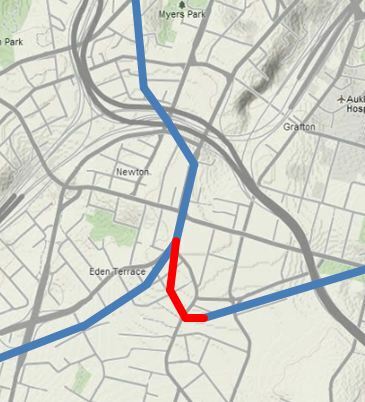 The key thing would be to build the link as an at grade junction but before you all jump up and down hear me out. Most people know that an at grade junction, either on road or rail, limits the capacity of the network. On a rail network like ours, the number of at grade junctions can often mean that one late running service causes ripples throughout the rest of the network. We do know however that the junction at Quay Park (outside Britomart) and at Westfield have the ability to handle about 20 trains per hour in each direction (TPH). By comparison the most suggested that we could get with the CRL was 30 TPH although with through routing of serives it represents a much larger capacity increase. From what I have heard, a more realistic number for us to achieve would have been 24-26. We obviously want to avoid the issues of delays grinding the rest of the network to a halt so as part of this we would however need to grade separate the other junctions of which Newmarket would probably be the hardest. With that done we should then be able to easily run 20 TPH through the CRL without the delays spreading to the other junctions and our services could be designed to reflect this. The pattern above could then have 10 TPH on each line which would represent a train every 6 minutes and a peak frequency up or down the CRL of a train in each direction every 3 minutes. Of course this means that at about the same time as it will take for us to need a new harbour crossing we will likely also be looking to take some pressure of the CRL and that is where the line from Parnell to the North Shore comes in. In effect this this would be taking a leaf out of the motorway builders book where by they build a section then and leave it for few years while pressure builds up from the public who demand money be spent on finishing the job. But what happens to the link after “The Cross” is completed. My thoughts are that the link will still be useful for a number of possible reasons. First it allows trains from the east to also use the spare northern link at Newmarket to get back stabling yards either at the strand or down at the EMU depot in Wiri. Another option might be investigate using the tunnels as a linear stabling yard to help save on operational costs or perhaps we just keep them for use in emergencies. I guess though that the key thing is it gives us options and at the very least we should include it it in the designation phase. I think at the end of the day there are some good arguments for either building it or not. I haven’t actually decided what my preferred option is but think it is good for us to discuss them. I’ve been reading the blog for years, but none of these flashbacks are in my memory banks. Not sure what people said at the time, and heaven only knows how relevant it may be, but in Wellington we have a big motorway junction (Ngauranga Gorge) and one of the branches of the train line (i think perhaps the Kapiti line) goes racing across the motorway, above ground. A few metres away, another train line (the Hutt and Wairarapa lines) crosses underneath the same motorway. I know – radical, isn’t it – almost like a real version of Metropolis. Built way back in the day. Actually, most people in cars don’t even notice it and would probably not even know it is there. But I say this only because I’m still amazed that the new CRL is going to go to Newton underneath the motorway. If you were to have a second train route in the region (such as an Eastern link) I’d be looking for it to be zipping over the top of the m’way, rather than under. Railway bridges are nothing to be ashamed of. The motorway junction on the surface is irrelevant, the line needs to be so deep to get between Aotea and Mt Eden station it passes far below K Road, the motorway and Eden Terrace. Getting up to the surface at the motorway, let alone onto a bridge over it, is impossible. I actually wonder why they bothered keeping the western line to Newmarket. Without that the east link wouldn’t need to be grade separated. Freight trains need to get to Northland Jimbo. A few freight trains don’t require expensive grade separation where the CRL will join the NAL. Do we really need a direct to Newmarket? It just saves three stops (the most used stops on the network). Or a cross platform transfer at K Road.